You can easily configure Google / Gmail contacts to sync with an iOS device like an iPhone, iPad, or iPod touch. This transfers all Google Contact details onto the iOS device, in addition to keeping all contacts in sync, meaning any changes made in one service will carry over to the other nearly instantaneously. This functions much like how iCloud syncs contacts between Apple devices, except it offers the ability to sync across platforms and between Apple and Google services. This is very easy to setup but before beginning you should take a moment to back up your iPhone contacts. You can do that either with iTunes, iCloud, or by exporting them from the web, and doing so insures that you will have a proper copy intact in the event something does go awry with the sync setup procedure. It’s fairly unlikely something will go wrong, but it’s always better to be safe than sorry. If you have a huge contacts list stored with Google it may take a moment to sync. 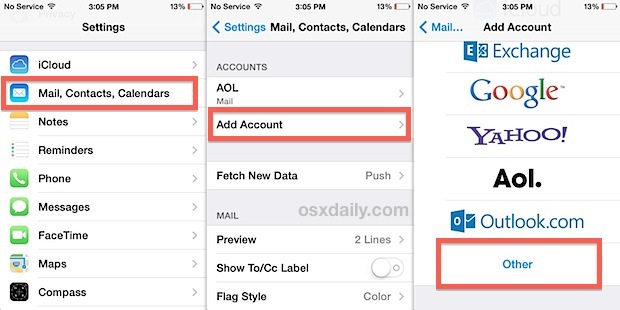 Launch the “Contacts” to confirm that your Google/Gmail contacts are now on the iPhone, iPad, or iPod touch. 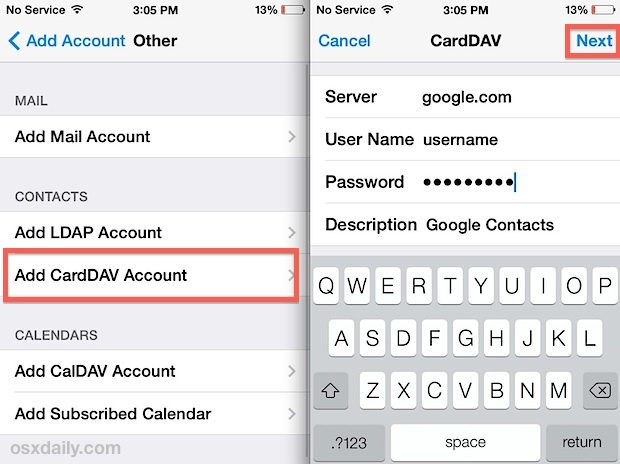 CardDAV is excellent and syncs both ways, meaning if you make an edit or adjustment on your iOS device, it will sync back to Google and Gmail, and similarly, if you make a change or add a new contact from Google’s services, it will sync back to the iOS device. This is done entirely outside of Apple’s iCloud and handled by Google instead. This makes it an excellent choice for users who split smartphone usage time between Android and iPhones, and it also happens to be the easiest way to migrate contacts from one device platform to another if you happen to be making a more permanent switch. Mac users can also sync the OS X Contacts (Address Book) app with Google Contacts by following these instructions. Doing so will insure that all Google contact details are in sync between the desktop OS X, mobile iOS, web Gmail, and Android worlds. Thanks to @Nilesh for the tip idea, don’t forget to follow @osxdaily on Twitter too. Today I bought an iphone 5s and wanted to import my contacts from my gmail address. Did just as you described above. But could not. Tried so many times. Received SSL is not available. something like this. I don’t remember exactly. Cannot get again.